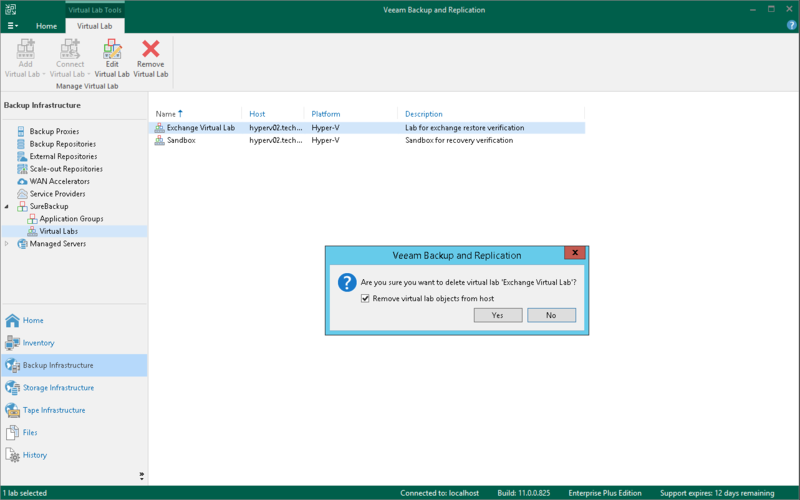 Always use Veeam Backup & Replication to modify or delete a virtual lab. If you change lab settings or delete any of its components from outside, for example, in Hyper-V Manager, the lab will be corrupted and its component such as the created virtual switch will remain in the virtual infrastructure. If you want to remove virtual lab objects from the virtual environment, in the displayed window select the Remove virtual lab objects from host check box. If you do not select this option, Veeam Backup & Replication will disconnect the virtual lab from the backup server. You will be able to connect to this virtual lab later.